I am looking forward to learning about game design and modeling from everyone in the forum! I have been very busy working on my first game. It is called "Fire & Maneuver: WWII." It is a two player tactical tabletop war game set in WWII. The actions are initiated with Action Cards and resolved with dice. Successful gameplay is based on good drafting of the Action Cards, using the units to mutually support each other and playing the" Action cards with good timing. It will be a print and play. The theaters of WWII will be presented in expansions. All of my effort is going into the Eastern Front right now. Probably going to focus on the battles from the June, 1941 (Operation Barbarossa) until the Battle of Stalingrad (August, 1942-February, 1943). Right now the game has ten different types of Infantry units with their different specialties and capabilities (Scouts, Snipers, Mortars, etc.). The Armored Fighting Vehicles are Tanks, Self Propelled Anti-Tank guns and Self Propelled Artillery. Towed Artillery units are also used. I attached a few prototypes of the units, they are billboards with most of their information printed on them, including their Victory Points. The art on the Action Cards is from WWII posters. I am finding many great pieces of period art to use. Here a few samples of the prototypes. That is very good advice. What I am using are posters released by their respective governments into the public domain. I have learned that the German artists retain copyright for 70 years after their death, so I am limited to the USA, USSR and Finland so far. I will learn more about the copyright status of the other countries because I have found some great posters that are a very good match for the actions on the cards. 2) when the US government bowed to pressure from Disney and other high-powered copyright, not only did they add 20+ years to extend copyright for US creations (up from 75 years post-publication), some have argued that many nations must also comply because they all signatories to a specific agreement, the name of which escapes me at the moment. I'd looked into this in some detail years ago, and kept up with it to an extent, but eventually the complexity made my head spin. It's a daunting business, but a rewarding one If you can figure it out. I wish you the best of luck, and look forward to seeing what more you've learned! WackyAnne, no need to apologize, this is not a derail of the thread. This is the attention to detail that benefits the game that I get from working with dedicated forumites! Thanks for the info on Canada. If I find too many limitations in the public domain I might shift to commissioning artists to make WWII posters for my Action Cards. 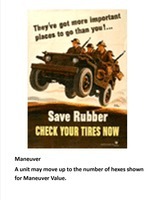 I also plan to have some WWII postage stamps in the rulebook. 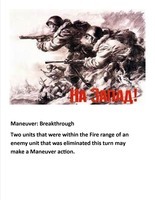 The Action Cards for Fire & Maneuver:WWII went on a diet. They had been living large on many text intensive meals. Now a lot of the text has been replaced with one key word. The key word can be referenced in the rules. For example, some cards used to say "Must discard one Action Card to use." Now they say "Discard:1." After a quick look at the definitions/key terms in the rules we see "Discard:X: Must discard X Action Cards to use this Action Card." Cards that had "Friendly Fire" used to have "If any friendly units are adjacent to the enemy unit, Friendly Fire occurs on a roll of 1. The friendly and the enemy units must Take Cover." Text-lite is definitely better. BTW ... Today marks the anniversary of the Battle of Kursk, the largest tank battle of all time. The Eastern Front will probably be the first release and will absolutely have a Kursk battle. Hard to resist gaming in a front with LOTS of tanks, partisans, sabotage, ski troops, breakthroughs and tank riders. Definitely a turning point in the war on the Eastern Front. Afterwards it was said that tanks were aflame in all directions as far as the eye could see. For those that haven't read about it, I encourage you to. Oops, just found another game named "Fire and Maneuver." Not sure if it has been published but apparently it has been play tested for quite a few years. Thinking about changing to "Tank Shock:WWII." After doing lots of Google haven't seen this being used. Another name could be "Tanks in the Wire:WWII." After three and a half years of silence they pop up again just when you're getting started, unfortunate timing. No sweat, Tank Shock has better alliteration, is only two syllables and accentuates a game that is very tank centric. This motivates me to move even faster to get Tank Shock into production. Another play testing session for Tank Shock: WWII. The battle is set in the snow. Notice that the Allied defenders of the town have Ski Troops in reserve. They get to move one extra hex on snow and ice. There are also Partisans in the forest (those are the guys with the sticks of dynamite). The defenders of the town kept falling back and took out two Tank units but they lost too many units and a Tank unit overran the town. The game was to 30 Victory Points and the town was worth 15 Victory Points. Fortunately one Tank unit was eliminated when it tried an unsuccessful crossing of the river of ice. The other play tester helped me realize that two of the Action Cards should be played like Interrupts in M:TG. The rules will be revised to allow those two cards to be used by the defender when his unit(s) are being fired at. I found plans for several versions so I'll see about knocking out a model. Great to have more Arctic Infantry in action! The theaters of WWII will be presented in expansions. All of my effort is going into the Eastern Front right now. Probably going to focus on the battles from the June, 1941 (Operation Barbarossa) until the Battle of Stalingrad (August, 1942-February, 1943). Right now the game has ten different types of Infantry units with their different specialties and capabilities (Scouts, Snipers, Mortars, etc.). The Armored Fighting Vehicles are Tanks, Self Propelled Anti-Tank guns and Self Propelled Artillery. Towed Artillery units are also used. The artwork I saw for World of Tanks looks beautiful, thanks for sharing. I will have to find time to play this game. The card game is described as needing good deckbuilding to get the squad ready to fight, so I see that the scale is a bit different from my game. My game will focus on the control of multiple Company level units. The specialty units (Scouts, Mortars, Anti-Tank, etc.) will also be available as platoons to augment the main forces. Currently looking for some free WWII models (Infantry, Armor, Artillery) to use as prototypes during playtesting. Have had good success with Junior General but would like to find out what else is available. The units are printed on 1.25" Wide x 1.75" High card stock. The Infantry are not to scale to the Tanks and Artillery, just trying to get as much of the picture on the stand as possible. Just finished play test #13. The Wehrmacht was tasked with taking a lightly defended town. The Red Army was able to use the T-34s that started the battle in reserve to occupy the hill line in the center of the battle where they were able to stop the Wehrmacht advances along both axis of advance. The Red Army Anti-Tank units and the Sniper unit took out several units before being eliminated. The Red Army Cossack Cavalry used their maneuverability to secure the forest on the left flank, causing the Wehrmacht to try the high risk dash along the hill tops and through the passes, which is where the T-34s lit them up. The last four play test sessions have led to more of the Action Cards being modified to be used as Interrupts/Reacts by the Defending player when his units are being fired at. This moves the game more towards simultaneous play instead of the traditional I-go-you-go. "Comrade, what do I do when my tank runs out of fuel?" "What do I do when my tank runs out of ammo?" I got enough brain power and energy together to work on the Aerosan, taking a break before doing the engine section, then it's on to unfolding, probably tomorrow for that. This should be a fun model for 30mm scale but I don't recommend shrinking it own to 6mm scale for your wargame. Not worried about the scale as the images of the tanks, artillery and infantry on the billboards are not to scale, relative to each other. I just try to squeeze as much of the image as possible onto the billboard. Somehow, someway, Tank Shock will have to have an Arctic warfare expansion. Not sure of the market demand, but I do know that Chuck Conroy is hot for it. We had the good fortune to hear Uncle Stavos recount one of his battles in the Great Patriotic war recently. He was even able to snap a few photos in the midst of all the action. Here are the results from another play test session. In this battle the Soviet Partisans were attacked in their forested villages by Wehrmacht Infantry and Cavalry with a Mortar in support. The graphics got a huge upgrade recently. Squirmy Dad showed me what could be done to upgrade the symbols and background. The before and after Scout unit cards are shown for comparison. I made the before version in Microsoft Publisher with a figure from the Junior General site. The F value is for the firing range in hexes of the weapon. The terms "Fire" has been changed to Range, so the "F" will be replaced by "R". The S value is for the Strength (wounds) of the unit. The M value is for the maneuver range in hexes of the unit. The VP represents the Victory Points value of the unit. How do you feel about the colors and the left to right orientation of the symbols and values? Squirmy Dad and I both have color vision shortages and we both thought the black on yellow had the best contrast. How do you feel about the colors and the left to right orientation of the symbols and values? Counter-based board wargames using hex-maps have long favoured numerals in order of Attack-Defence-Movement, so your system clearly follows in that "tradition". The information is clear enough on both versions of your unit markers regardless of this, and the symbol colours seem fine to me (with normal colour vision). I'm not too sure about the graded blue-to-white marker background though, which looks a little "mechanical" and unreal. Possibly that's because of the "standard" blue colour, however. Does the colour have a game significance? If so, and it relates to the specific unit in some way, perhaps it would be better set up as a vertical oval centred on the figure. If it's a nationality indicator, or indicative of a larger unit designation (regiment or division, say), that may be better achieved with a more uniform background colour to the marker, or a simpler additional symbol. With a print-and-play game, it's helpful if any use of colour makes sense in game terms, and isn't simply to avoid having a (more printer-friendly!) white background.